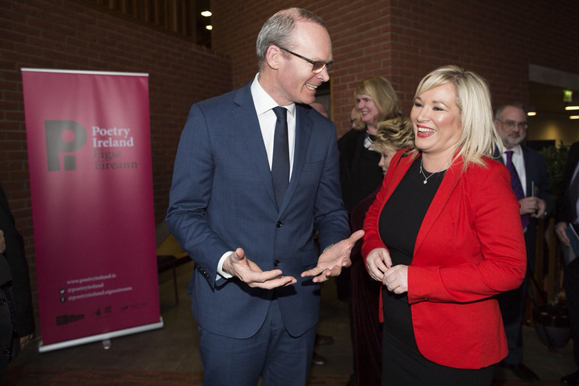 Tánaiste Simon Coveney and Michelle O'Neill, Northern Irish leader of Sinn Féin, at the Belfast event. A night of creative expression recalling the Troubles in Northern Ireland, sponsored by the Irish government in tandem with Poetry Ireland, was exhibited at both the Lyric Theatre in Belfast and the Barbican Centre in London in April in honor of the Good Friday Agreement’s 20-year anniversary. The program, called “A Further Shore,” focused on the necessity of keeping the spirit of goodwill with which the peace agreement was written. The exhibition boasted high-profile participants, showcasing performances by Atifete Jahjaga, Kosovo’s first female president, along with Irish actors Adrian Dunbar, Ciarán Hinds, Maria Doyle Kennedy, and Tara Lynne O’Neill. Readings of Irish poetry on the subject dominated the program, including works by Seamus Heaney, Gráinne Tobin, and John Hewitt, and moving musical performances by the Telegraph band and fiddler Ciarán Tourish. Aan raibh aon fhocal Gaeilge le cloisint ag an áit seo?